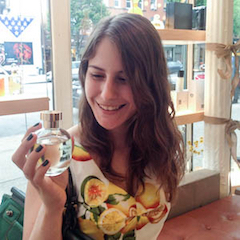 Finally fulfilling my fragrant destiny*, I’m Nordstrom’s newest Guerlain girl! After three delightful months in the fragrance department, I’ve been transferred to the Guerlain counter. You won’t catch me complaining about selling $54 lipsticks and $455 face creams, but our perfume selection is a little painful. Out of the dozens of iconic fragrances Guerlain has created over the last 200 years, we carry exactly one (Shalimar, of course). So imagine my excitement when I unpacked Terracotta Le Parfum last week, literally doubling our fragrance selection! Guerlain calls Terracotta Le Parfum, their seasonal summer fragrance as of 2014, “a sun-soaked invitation to explore faraway lands.” It’s supposed to recall those oh-so-French, SPF -10 bronzing oils that beach bunnies of the past wore on their glamorous St. Tropez vacations. “Sun-soaked” or not, Terracotta is a less literal sunscreen fragrance than scents like Bobbi Brown Beach, Bond No. 9 Fire Island, or CB I Hate Perfume At The Beach 1966. Instead, Terracotta is one of those rich, sultry white florals that make me want to evacuate the room. SOOOOO discouraging…..WHAT ARE THEY THINKING…..After 50+ years of lusting after ‘fumes,Vtg. Shalimar,is the only one I care about,from this House……PS….ALWAYS love your posts! The Nordstrom here had two the last time I checked: Shalimar and LPRN. I’ll have to see if they have Terracotta now, for a 50% increase. I’m so jealous of your Nordstrom!! Someone asks for LPRN at least once a day. We clearly had it at one point, since the promotional materials are in our drawers… Our restocking process is a little mysterious. I’m so glad you reviewed this one. I was curious about it. Thanks. My pleasure, Katherine! So do you think you’ll try it? I can’t find it anywhere where I live. I might order a decant. I’m interested in the new fancy sparkly Tom Ford Bronze Goddess copycat too. It gets so hot here in the summer that I need something that doesn’t smother me. Hi Yuliya! I haven’t had the chance to try Terre d’Ete specifically, but most Guerlain products have the same violet-y fragrance. If that sounds right, the discontinued Guerlain Meteorites fragrance was very close, and I bet you’d also enjoy Chanel Misia or Frederic Malle Lipstick Rose for their rose-violet lipstick accords. Good luck!